Download my document HERE. Print copies of the following pages equal to the amount of groups you will have. Cut out the circles (discarding the key words) and put each set of circles in envelopes. You may want to keep an extra copy that is not cut out for yourself that will be your answer sheet. Divide your Primary into small groups (about 4 or 5 would be preferable). Have the groups sit on the floor and put their circles in order as everyone sings the song a few times (it probably will be mostly you and the teachers at first). The first group to get their pictures in order correctly, wins. Check answers by having the Primary sing the song through again. Switch up groups again and play again until you run out of time. This activity with groups probably will work best for Senior primary. For Junior Primary I'd recommend printing off the large circles located in the link above in my original lesson plan and play this game on the chalkboard using tape or magnets, no groups and everyone just playing together. 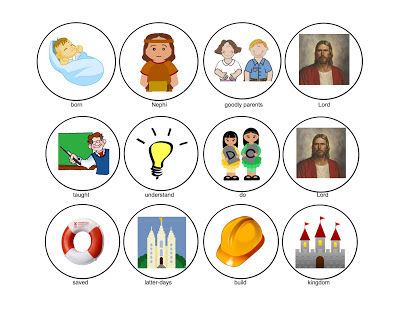 Have a few kids come up at a time to place a few circles in order as the Primary sings. Stop and check answers, change kids and continue singing. This is awesome! I used it as a review this week and the kids LOVED it. They were so focused. It was a complete success. Thank you!